A Design Engineer undertakes to perform researching tasks and comes up with new ideas for creating new products or application. 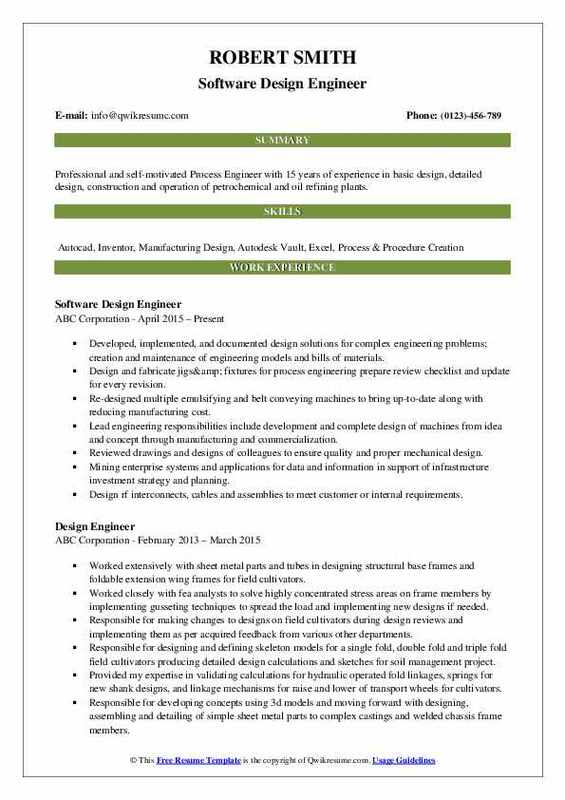 A professional Design Engineer Resume includes the following tasks – researching and creating new products; determining the target audience of the product, developing virtual methods of different designs; finding out manufacturing requirements by estimating production costs and examining materials; modifying designs and retesting them, using CAD and CAM systems for designing and visualizing projects; identifying new systems and processes; and leading team of engineers. 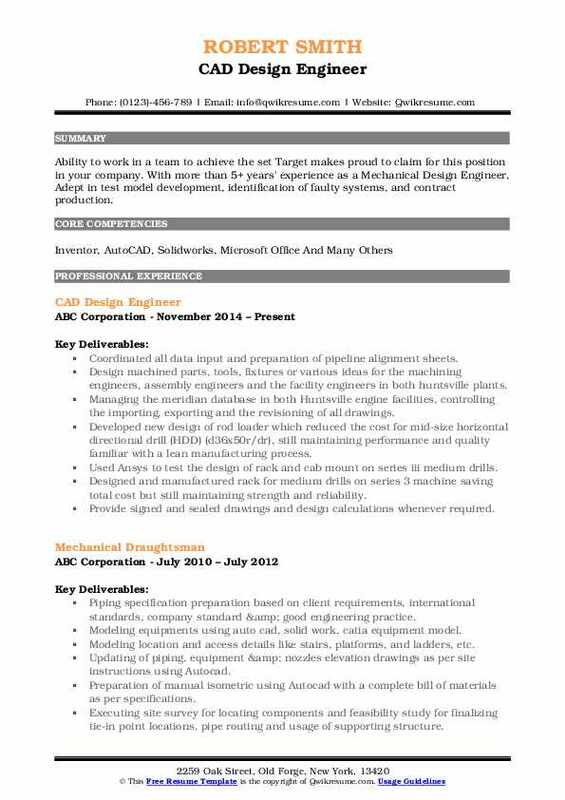 To succeed in this career, the following qualities are required – good visual and spatial awareness; a good understanding of different manufacturing and construction methods; staying updated with new developments, and comprehensive knowledge of various materials qualities mainly metals. 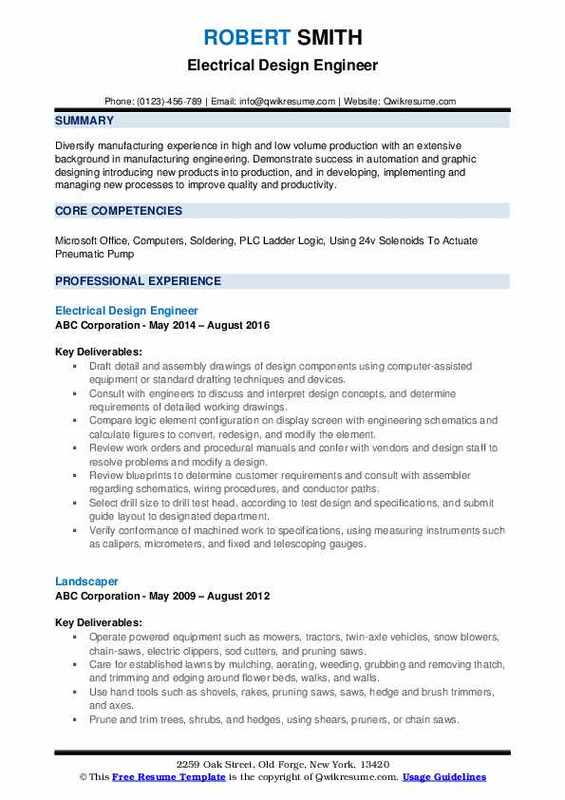 To get hired in a competitive job market, candidates need to be educated at least to a bachelor’s degree in engineering fields such as computer-aided product design, engineering design or industrial product design. Summary : A goal oriented, technical design engineer that by the use of creativity, teamwork, and leadership is able solve complex problems by using pertinent, cost-effective, and efficient approaches. Coordinated with a customer on details of each project and assisted engineering manager with quoting. Designed components for GPS satellites and designed and implemented programmable computer chips for military wireless communications systems using HDL for simulation and synthesis. Involved in the continuous development and testing of the firmware of the products. Design, and manufacturing of connectors for the electronic and automotive industry. Designed work holding components for lathes, custom machine parts and tooling other machining applications. Includes fusing data from several sources to conduct analysis and provide reports, tables, graphs, and charts. Made final sketch of proposed drawings, checked for a dimension of parts, materials that were used. Summary : Diversify manufacturing experience in high and low volume production with an extensive background in manufacturing engineering. Demonstrate success in automation and graphic designing introducing new products into production, and in developing, implementing and managing new processes to improve quality and productivity. Draft detail and assembly drawings of design components using computer-assisted equipment or standard drafting techniques and devices. Compare logic element configuration on display screen with engineering schematics and calculate figures to convert, redesign, and modify the element. Review work orders and procedural manuals and confer with vendors and design staff to resolve problems and modify a design. Verify conformance of machined work to specifications, using measuring instruments such as calipers, micrometers, and fixed and telescoping gauges. Select and set cutting speeds, feed rates, depth of cuts, and cutting tools according to machining instructions or knowledge of metal properties. 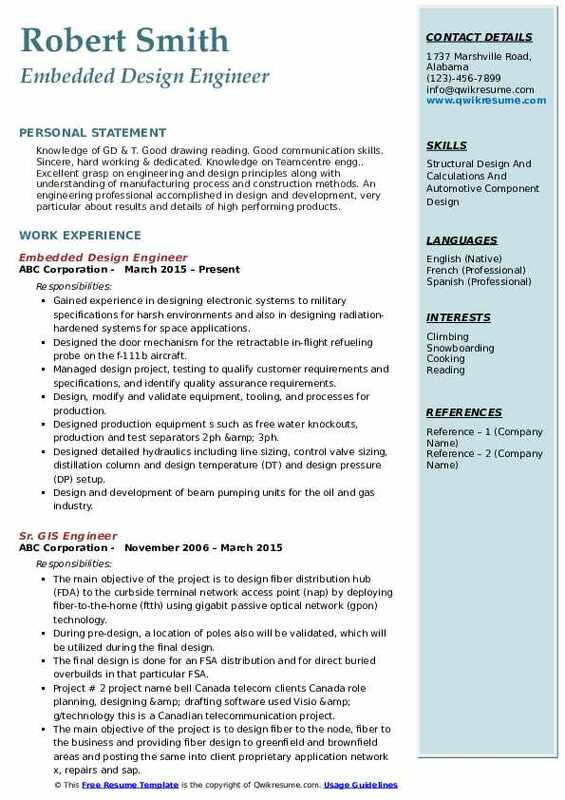 Headline : Professional and self-motivated Process Engineer with 15 years of experience in basic design, detailed design, construction and operation of petrochemical and oil refining plants. Developed, implemented, and documented design solutions for complex engineering problems; creation and maintenance of engineering models and bills of materials. Design and fabricate jigs& fixtures for process engineering prepare review checklist and update for every revision. Re-designed multiple emulsifying and belt conveying machines to bring up-to-date along with reducing manufacturing cost. Lead engineering responsibilities include development and complete design of machines from idea and concept through manufacturing and commercialization. Reviewed drawings and designs of colleagues to ensure quality and proper mechanical design. Mining enterprise systems and applications for data and information in support of infrastructure investment strategy and planning. Design rf interconnects, cables and assemblies to meet customer or internal requirements. 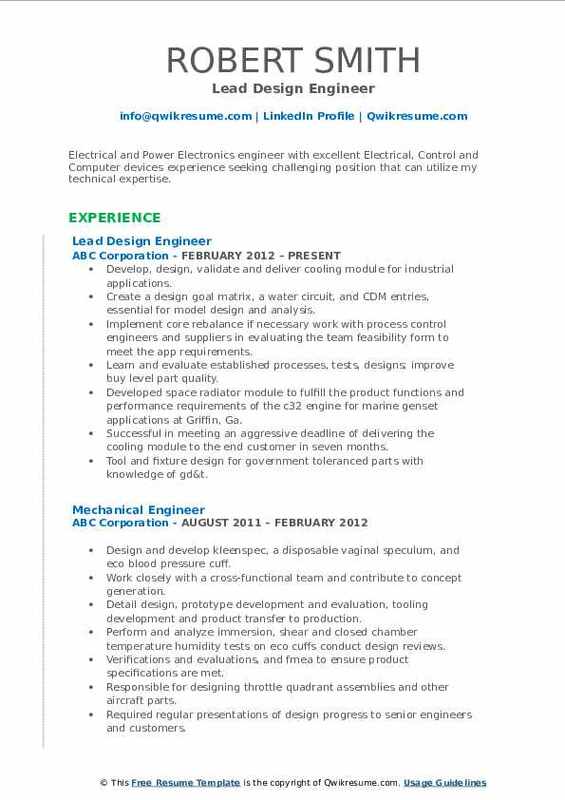 Headline : Electrical and Power Electronics engineer with excellent Electrical, Control and Computer devices experience seeking challenging position that can utilize my technical expertise. Develop, design, validate and deliver cooling module for industrial applications. Create a design goal matrix, a water circuit, and CDM entries, essential for model design and analysis. Implement core rebalance if necessary work with process control engineers and suppliers in evaluating the team feasibility form to meet the app requirements. Learn and evaluate established processes, tests, designs; improve buy level part quality. Developed space radiator module to fulfill the product functions and performance requirements of the c32 engine for marine genset applications at Griffin, Ga. Successful in meeting an aggressive deadline of delivering the cooling module to the end customer in seven months. Tool and fixture design for government toleranced parts with knowledge of gd&t. Summary : Knowledge of GD & T. Good drawing reading. Good communication skills. Sincere, hard working & dedicated. Knowledge on Teamcentre engg.. Excellent grasp on engineering and design principles along with understanding of manufacturing process and construction methods. 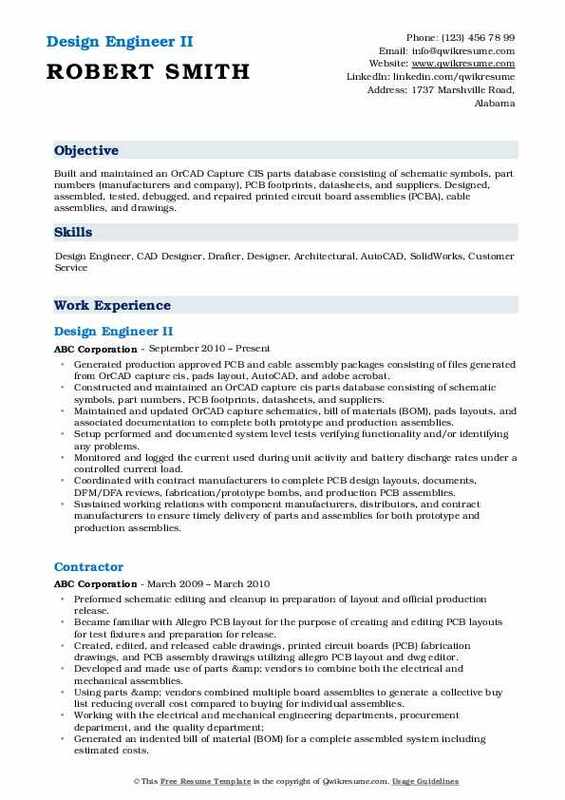 An engineering professional accomplished in design and development, very particular about results and details of high performing products. Gained experience in designing electronic systems to military specifications for harsh environments and also in designing radiation-hardened systems for space applications. Designed the door mechanism for the retractable in-flight refueling probe on the f-111b aircraft. Managed design project, testing to qualify customer requirements and specifications, and identify quality assurance requirements. Design, modify and validate equipment, tooling, and processes for production. Designed production equipment s such as free water knockouts, production and test separators 2ph & 3ph. Designed detailed hydraulics including line sizing, control valve sizing, distillation column and design temperature (DT) and design pressure (DP) setup. Design and development of beam pumping units for the oil and gas industry. Summary : Built and maintained an OrCAD Capture CIS parts database consisting of schematic symbols, part numbers (manufacturers and company), PCB footprints, datasheets, and suppliers. Designed, assembled, tested, debugged, and repaired printed circuit board assemblies (PCBA), cable assemblies, and drawings. Generated production approved PCB and cable assembly packages consisting of files generated from OrCAD capture cis, pads layout, AutoCAD, and adobe acrobat. Constructed and maintained an OrCAD capture cis parts database consisting of schematic symbols, part numbers, PCB footprints, datasheets, and suppliers. Maintained and updated OrCAD capture schematics, bill of materials (BOM), pads layouts, and associated documentation to complete both prototype and production assemblies. Setup performed and documented system level tests verifying functionality and/or identifying any problems. Monitored and logged the current used during unit activity and battery discharge rates under a controlled current load. Coordinated with contract manufacturers to complete PCB design layouts, documents, DFM/DFA reviews, fabrication/prototype bombs, and production PCB assemblies. Sustained working relations with component manufacturers, distributors, and contract manufacturers to ensure timely delivery of parts and assemblies for both prototype and production assemblies. Worked closely with other design engineers, manufacturers, and contract manufacturers to find and procure alternate parts that were not listed on the original box and then adding the alternate parts to the office all. Designed, documented, and coordinated with contract manufacturers to complete production cable drawings and assemblies. 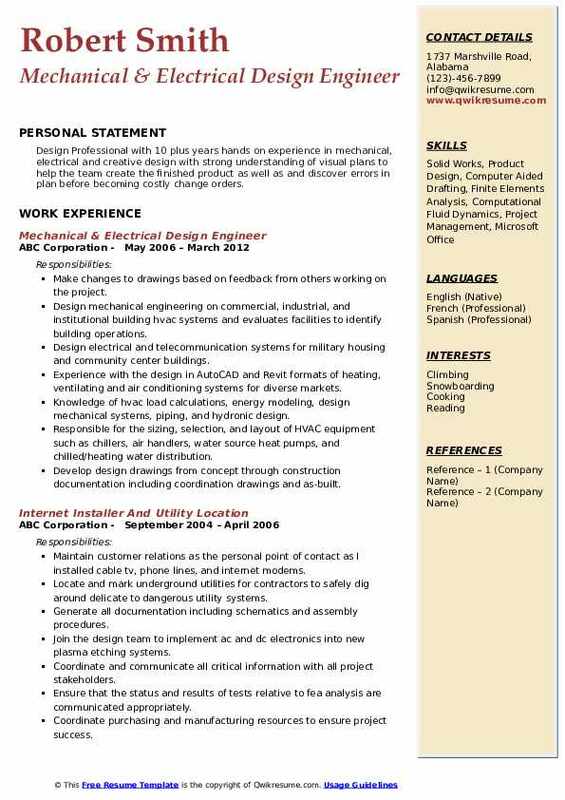 Summary : Mechanical Engineer with seven years of experience in the areas of product design, reverse engineering, employee training, team design work, destructive/non-destructive testing procedures, 3D modeling, drafting, lean manufacturing, customer services, and sales services. Effectively communicates designs between sales personnel and union employees for optimum efficiency in daily work orders and projects. Experienced in optomechanical engineering; combining images from multiple cameras to create a single image and designing fixture to account for lens tolerance. Providing support to electrical engineers by created dxf for PCB layout, selecting and managing connectors, and cable layout. Achieved high satisfaction from customers and was complimented for high-quality work. Maintained all files for engineering drawings, art prints, and math models. Worked with the customers to make the best design for them in special situations. Skills used to design, stress calculations, pressure calculations, flow calculations, cost estimation, and package assembly instructions. Developed and maintain tooling inventory cataloging system used Solidworks 3-d cad to design new or modify existing thermoformed products i. E.
Summary : Ability to work in a team to achieve the set Target makes proud to claim for this position in your company. 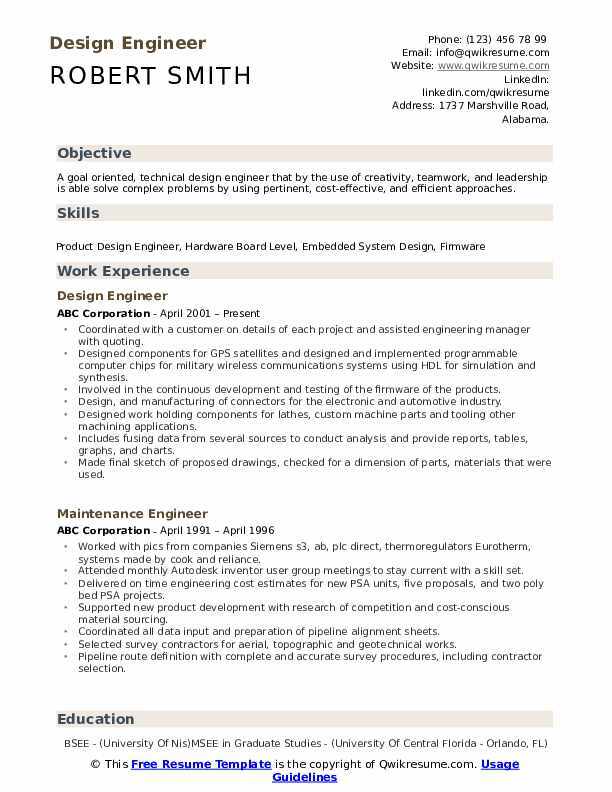 With more than 5+ years' experience as a Mechanical Design Engineer, Adept in test model development, identification of faulty systems, and contract production. Coordinated all data input and preparation of pipeline alignment sheets. Design machined parts, tools, fixtures or various ideas for the machining engineers, assembly engineers and the facility engineers in both huntsville plants. Managing the meridian database in both Huntsville engine facilities, controlling the importing, exporting and the revisioning of all drawings. Developed new design of rod loader which reduced the cost for mid-size horizontal directional drill (HDD) (d36x50r/dr), still maintaining performance and quality familiar with a lean manufacturing process. Used Ansys to test the design of rack and cab mount on series iii medium drills. Designed and manufactured rack for medium drills on series 3 machine saving total cost but still maintaining strength and reliability. Provide signed and sealed drawings and design calculations whenever required. 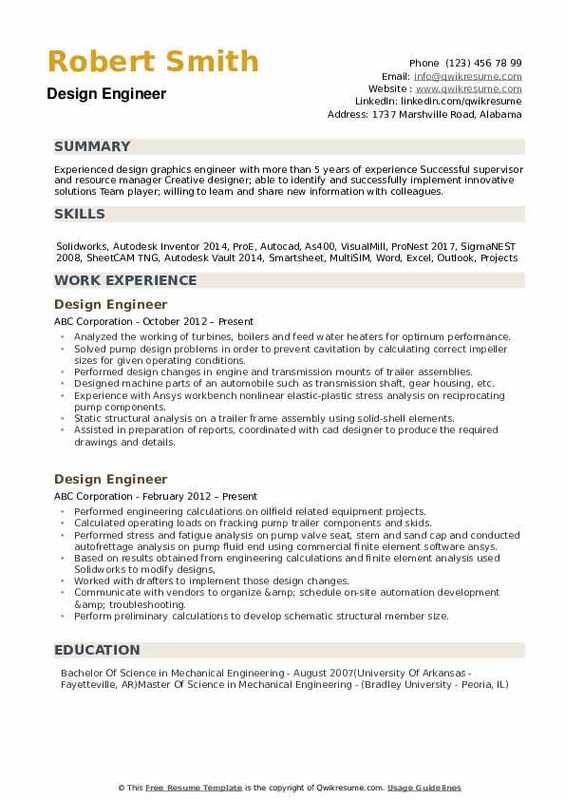 Summary : Design Professional with 10 plus years hands on experience in mechanical, electrical and creative design with strong understanding of visual plans to help the team create the finished product as well as and discover errors in plan before becoming costly change orders. Make changes to drawings based on feedback from others working on the project. Design mechanical engineering on commercial, industrial, and institutional building hvac systems and evaluates facilities to identify building operations. Design electrical and telecommunication systems for military housing and community center buildings. Experience with the design in AutoCAD and Revit formats of heating, ventilating and air conditioning systems for diverse markets. Knowledge of hvac load calculations, energy modeling, design mechanical systems, piping, and hydronic design. Responsible for the sizing, selection, and layout of HVAC equipment such as chillers, air handlers, water source heat pumps, and chilled/heating water distribution. Develop design drawings from concept through construction documentation including coordination drawings and as-built. 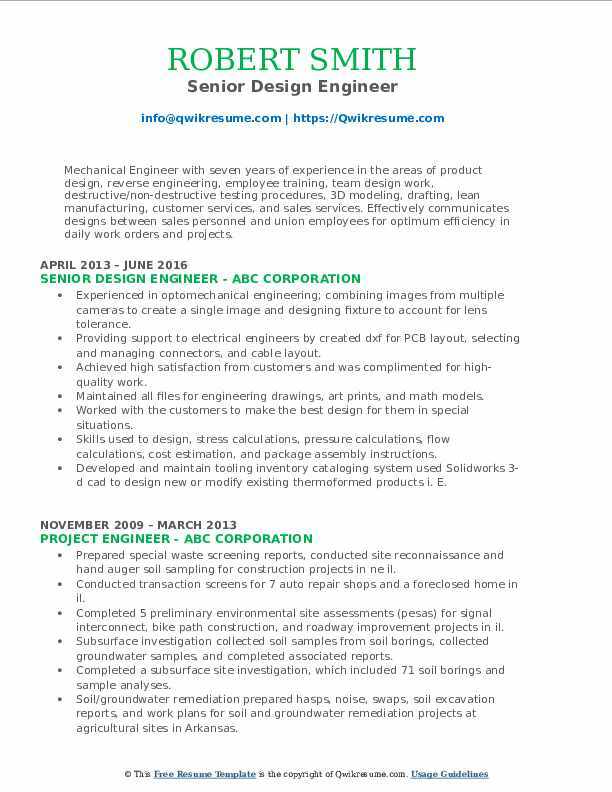 Headline : Experienced design graphics engineer with more than 5 years of experience Successful supervisor and resource manager Creative designer; able to identify and successfully implement innovative solutions Team player; willing to learn and share new information with colleagues. Analyzed the working of turbines, boilers and feed water heaters for optimum performance. Solved pump design problems in order to prevent cavitation by calculating correct impeller sizes for given operating conditions. Performed design changes in engine and transmission mounts of trailer assemblies. Designed machine parts of an automobile such as transmission shaft, gear housing, etc. Experience with Ansys workbench nonlinear elastic-plastic stress analysis on reciprocating pump components. Static structural analysis on a trailer frame assembly using solid-shell elements. Assisted in preparation of reports, coordinated with cad designer to produce the required drawings and details.